Aantrekkelijk Georgiaans huisje, comfortabel ingericht en gemoderniseerd maar met behoud van zijn charme en karakter. De ligging is een van de beste in het dorp aan de haven met uitzicht op zee. 2 zitkamers en een aparte eetkamer. De zitkamer aan de voorzijde (zie foto) heeft een prachtig uitzicht door een raam van de haven en de open zee. Staithes is een historisch vissersdorp in het North York Moors National Park, het trefpunt van schilders en fotografen. Er zijn veel originele olieverfschilderijen in het huisje geschilderd door de moeder van de huidige eigenaar. Het huisje was de helft van het originele "Shoulder of Mutton" -huis. Het dorp was vol passages van smokkelaars. • Grote goed uitgeruste keuken. Koelkast met vriesvak. Elektrisch fornuis, broodrooster, filterkoffiezetapparaat, magnetron en vaatwasser. Haard met traditioneel bereik en elektrisch vuur. Balkenplafond, steengroeve betegelde vloer. • Zitkamer 1: grenen lambrisering, eikenhouten vloer, balkenplafond, Victoriaanse open haard met kolen-effect vuur, flatscreen-tv, video en dvd. Zeezicht. • Zitkamer 2: "The Snug" met groot raam met uitzicht op de haven en de open zee. Boeken en games. Eiken vloer. • Slaapkamer 1: comfortabel kingsize Hypnos-bed, uitzicht op zee. • Slaapkamer 2: tweepersoonsbed en een eenpersoonsbed, met uitzicht op zee. • Badkamer: elektrische douche boven een bad, toilet, stopcontact voor dubbel voltage en scheerspiegel, verwarmd handdoekenrek. • Verwarming beneden: 3 elektrische boilers, 2 convectoren en 1 koleneffect vuur. Boven: 1 opslagkachel, 2 convectoren. • Prive-terras met uitzicht op de zee: stoelen beschikbaar. • Kenmerken: Onbelemmerd uitzicht op zee vanuit de meeste ramen. • Verwarming, elektriciteit, beddengoed en handdoeken inbegrepen bij de huur. • Garage beschikbaar, inbegrepen in cottage verhuur. Slaapplaatsen: 5. Sorry geen huisdieren, niet roken. Eenpersoonbadkamer met een elektrische douche boven een bad en een stopcontact voor een scheerapparaat en een scheerspiegel. Toilet inbegrepen. Unspoilt cottage in a fantastic location. Would recommend to anyone. We will be back! Lovely homely traditional cottage with modern kitchen appliances. In an central location with unspoilt views of the harbour. The beds were all comfy and the towels provided were plentiful and soft. Outside tap to wash sandy feet and wet shoes is an excellent addition. Overall the cottage has a quaint charm about it which is perfect for the surroundings of the village. Would definitely revisit and recommend. Thank you for your review.I am very pleased you liked the cottage and hope you will return next year. Cottage right on sea front great view comfortable and spacious. Only problem no parking at the cottage and the steepness of the hill up to the garage provided was not mentioned in any of the information. Nine out of ten. I am very pleased that you liked the cottage. 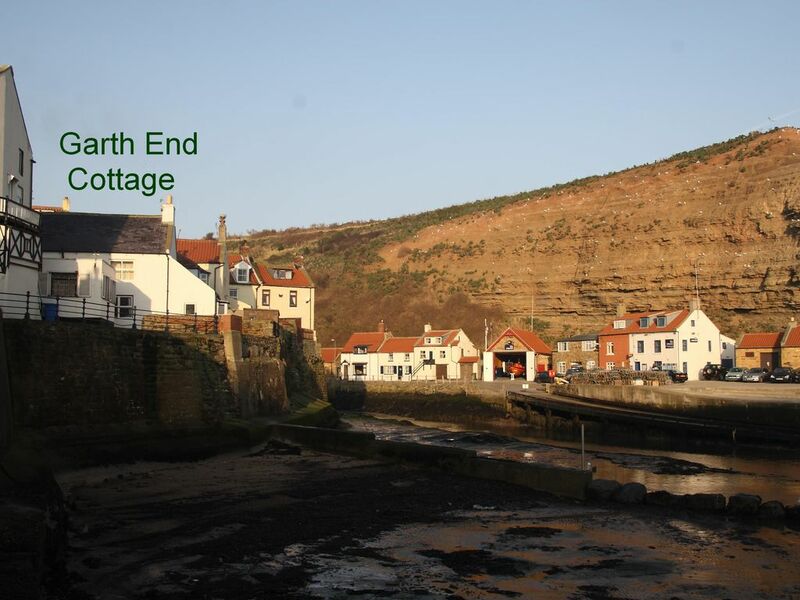 Parking is a problem at Staithes and very few properties have a garage and parking space. Thank you for pointing out the steep hill ,we will add it to the information about our cottage. A cosy and convenient ‘home from home’ with lots of charm and interesting features. We didn’t get very good weather during our Easter Break, yet staying as a family group in this cottage still made our holiday relaxing and enjoyable. This is due to the cosy and relaxing nature of the cottage and it’s location. You can while away the hours looking out of the big window over the harbour and we enjoyed the supply of quality books, games and DVD’s to supplement our own. Our bedroom looking out over the harbour too was very comfortable and we all slept well all holiday. One of the things I really liked was being able to find yourself in the heart of the village with its charm, cafes, pubs and interesting shops just a few steps from the peace and quiet of where you are staying. The kitchen is well equipped. I particularly enjoyed the individual paintings and pieces of pottery that add a unique character to the house. The only thing I would suggest to improve the stay would be to install a side gate; rope or No Entry sign on the side steps as many people think they lead somewhere and end up looking at you in the front room! This would give a bit more privacy I feel. Overall if you like individual and characterful places to stay this really suits. Thank you very much for your review.I am so pleased that you enjoyed the cottage despite the weather. I was particularly pleased that you liked the paintings as they were done by my mother. Thank you for your suggestion about the side gate, I think it would give more privacy. I hope you will choose to stay in the cottage again soon. Peaceful escape from the everyday! The property was right on the harbour so every morning began with views out to sea and long the cliffs. We loved discovering Staithes for the first time and felt at home straight away! We can't wait to come back! Thank you very much for your review.I am very pleased that you liked Staithes and the cottage and hope you will return soon. The cottage was clean and well equipped. There are sea views from the majority of the rooms. The sea views from the second sitting room are nothing short of breathtaking. It was lovely to sit and watch the waves crashing over the harbour breakwater during a particularly stormy day. We will return again next year to this little hidden treasure. Thank you very much for your review.I'm very pleased that you enjoyed your stay and the sea views. I hope that you will visit again soon. Het huisje is perfect gelegen voor het verkennen van de North York Moors, Eskdale en Whitby. Rockpoolen, vissen en fossielen jagen zijn allemaal bij de hand. De Cleveland Way (lange afstandspad) loopt door het dorp. Er is een klein museum in het dorp, evenals uitstekende winkels, pubs en restaurants. De Cbeebies-tekenfilm @Old Jack's Boat (waarin Bernard Cribbin als Jack is opgenomen, wordt in het dorp gefilmd. Cancellation Policy: non-refundable deposit of £50 on booking. Full balance of holiday payable one month before date of holiday. This is only refundable if cottage is re-let.